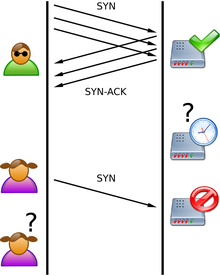 A SYN attack is an exploit of the TCP/IP stack where by an attacker send SYN packets and suppresses the SYN -ACK packet. This type of attack can be Volumetric where by the attacker send a large amount of data to a link to saturate the link . It can also be a trickle attack where the attack doesn’t generate a lot of bandwidth but ties up the resources on the devices. SYN attacks are a very common type of DDoS attack the SYN packet ties up a small amount of memory on the targets computer or network device. This is also known as a half open connection where the connection is not fully established since its still waiting for the fill handshake to occur. These half open connections can eventually exhaust the resources on the device eventually leading to a crash. To mitigate this type of attack you can rate limit SYN traffic per source also you can use mechanisms such as MOD Evasive fro Apache servers to protect web servers. For your Anti DDoS solution you may need to tweak settings if you are using NAT as its not unusual to see many SYN packets going to the single NAT address. How important is SSL inspection ?